Nathaniel "Nat" Turner (October 2, 1800 – November 11, 1831) was an American slave and Christian preacher. The Governor had scheduled about three thousand militiamen to stop the rebellion. The violent rebellion lasted two days until soldiers finally ended it, but Turner escaped. He hid for 6 weeks to avoid being killed. He was found on October 30. Turner was executed on November 11 by hanging. He was skinned. At least 55 white people were killed in the rebellion. The state executed 55 people, but acquitted a few. 200 black people were killed by groups of white people. Slaves as far away as North Carolina were said to be connected with the rebellion. Many were tried and executed. Because of the rebellion, new laws were made in Virginia. People could not bring black people together to teach them how to read and write. ↑ 1.0 1.1 "Nat Turner". Biography.com. Retrieved April 26, 2017. ↑ "Nat Turner's Confession". Retrieved January 17, 2011. 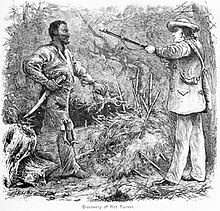 ↑ "Nat Turner leads slave rebellion". African-American registry. Retrieved January 17, 2011. ↑ "10 Things You May Not Know About Nat Turner's Rebellion". HISTORY.com. Retrieved March 13, 2018. ↑ "Nat Turner - Black History - HISTORY.com". HISTORY.com. Retrieved March 13, 2018. ↑ "Nat Turner's Rebellion". Public Broadcasting Station. Retrieved January 17, 2011. ↑ "Nat Turner's Rebellion". The Library of Virginia. Retrieved January 17, 2011. This page was last changed on 1 March 2019, at 19:52.